This Obby Project has been brought to us by Gabriela Szulman. Gabriela is an extremely talented mixed media artist, who creates greetings cards, furniture, scarves and everything in between that are inspired by nostalgia, memory and a love of all things vintage. Gabriela hosts our very popular decoupage workshops on Obby. You can see the full list of her classes here. Decoupage is a form of collage that can be used to upcycle and recycle unloved items into something extraordinary. You can use it on anything, from an IKEA stool, to a pair of unloved and dull shoes. Gabriela's work often is inspired by the past and memories and has a vintage feel to it. However, the beauty of decoupage is that you can create something that is entirely your own. Whether you are into clean shapes and lines or romantic flowers or collages with transcripts and words, decoupage upcycling and art is a beautiful way of creating something unique, special, and of course, handmade! 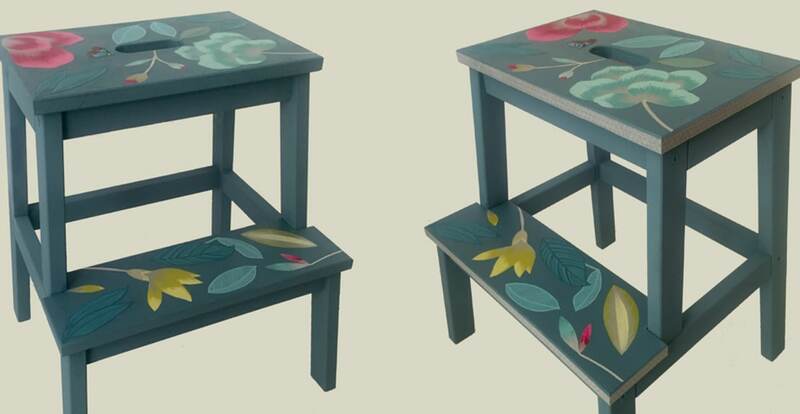 Step 1: Paint the stool with your chosen colour. One coat should be just enough. Step 2: While the paint dries, cut your shapes from patterned wallpaper: I used flowers and leaves in different sizes but you can use whatever takes your fancy. Step 3: Once the paint is dry, arrange the shapes on the two steps so that you know roughly where you’ll want to glue them. Step 4: Glue the paper shapes with Modpodge. Go over the shapes as well as under, the glue will dry clear. Try give it an even layer both under the shapes and then on top. The smoother your glue, the smoother and better your finishes project will be. Step 5: Add your washi tapes to the edges of your stool. This is optional, but is a great way to add character and depth to your project. Step 6: Finish by applying three coats of varnish to the two steps. You can varnish the legs too if you wish but this is not absolutely necessary. Below you can see both versions of the finished stool: with and without washi tape round the edge.